I usually feel like I am drowning in UFO's so seeing everything that I did manage to complete this past year is pretty gratifying. This year's New Year's resolution is a pretty simple one. I am NOT to start anything new until ALL the socks I so foolishly cast on a few months ago are done. For the record, I have 5 pairs on the needles. Yes, I am ashamed but in my defense, all but one pair are of hand dyed handspun that I just HAD to see knit. It happens. Rather than list all the project details, here is the link to my Ravelry project page where they all are living happily ever after. I've been keeping my sweet little mail lady busy lately. Yesterday I received a surprise package from Wandering Cat who is located in Canada and today she brought me one from France. She must think I am quite the bon vivant. Un grand merci pour ces magnifiques cadeaux-très sympa! Je te souhaite une très bonne année 2013-qu'elle t'apporte santé, joies et bonheur. Every once in a while something comes along that leaves you practically speechless. A few hours ago, after a very trying day with Daddio, who was once again at the hospital for tests, the post arrived. In it was a surprise package from dear Valerie of Wandering Cat Studio. She runs a dye business (with her equally talented mum) called Wandering Cat Yarns over on Etsy and on many occasions has kindly offered me advice when my misadventures have warranted it. I couldn't believe my eyes when I opened the package and was immediately transported to springtime. Not only did she send me this lovely skein of pretty Alley Cat but she had even named it Araignee's Rainbow. I don't have words to express my gratitude. 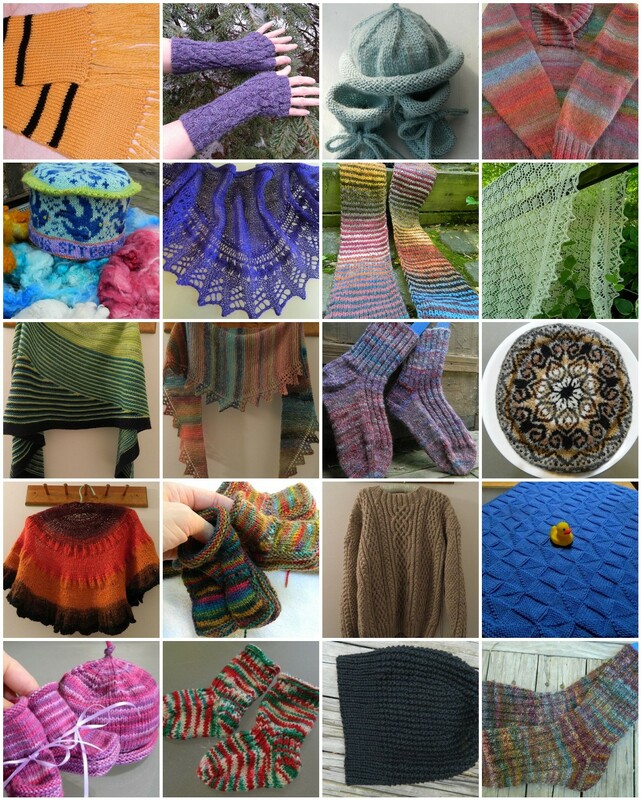 If you have never read her incredible blog (she knits at the speed of light), seen her patterns on Ravelry or visited her shop, you are missing out on the opportunity to be amazed. I can't thank her enough for lifting my spirits in a way only fiber folk can! There wasn't any holiday gift knitting this year to speak of but I was ready for all those messy holiday dishes with my brand new Christmas dishcloth. The pattern is the terribly popular Grandma's Favorite. I started out with another pattern and quickly realized the back was going to be ugly so I frogged it and started over. I love the clever way this pattern turns into a square just by adding a yarnover in every row. ...and then giving it a good wringing out. The next morning it was dry and ready to tackle the piles of yucky things that came its way. I hated knitting with this stiff cotton ( the decreases were excruciating) but I really want another one to take its place when the holidays are over. I just may have some better quality stuff packed away somewhere so I foresee some stash diving in the near future. Back at our house, Christmas Eve was a bust. We were all too tired to do anything but fall asleep while watching A Christmas Story. The next morning I had my usual Christmas breakfast of mince pie, egg nog and a tangerine. It was still damp and dark outside. The only snow I saw was on Christmas cards from friends in France and Latvia. I have been after The Mister to put a fireplace in the living room since we moved in twenty years ago. He has a wood stove in his man cave and I love it. Once again I had to make do upstairs with my lame video version. The man has no shame. My pile of presents included much needed and appreciated new knives, a $50 Victoria Secret gift card (!) and lots of chocolate candy. The last two gifts are definitely at odds with each other. Which would you choose- fitting into skimpy undies or a box chocolate heaven? Yeah, me too. The Mister also managed to find this sweater at Old Navy. I love it. Daughter and Son in Law gave me a coat from LL Bean. I love it too. We went ice skating in the afternoon in order to spend some time with Daughter who was the manager for the day and it kept me nice and warm without being to heavy to move in. By far the best gift I got, besides the new grandson, of course, was more time with Dear Old Doggie. Here she is in the kitchen getting herself a drink. She went from having to be fed hourly from an eye dropper to scarfing down her Christmas dinner all on her own. Her dear old heart kept going when everyone said it wouldn't. There may not be much time left, but I will take what I get as long as she is happy. I couldn't ask for anything more. Except maybe a little more of this. Taking Christmas to Dad's was not as easy as I thought. Balancing hot minestrone on my lap for the ride over was not fun. As soon as I walked in his door, I made myself a peppermint martini. I had been looking forward to one for days. This is pretty much how the old guy spent the day. He did wake up long enough to open his gifts. Little Sister had the showstopper with her gorgeous crocheted throw. I want one. He also was awake enough to eat Middle Sister's legendary lasagna. My veggie version was dry and bland. I need to get a better recipe. I say this every year but I always forget and make my equally legendary cardboard stuffed with cheese. My soup was a big hit, though. Next year maybe I should only bring this. Little Sister's cheesecake was amazing. I am so kicking myself for not bringing any home. What was I thinking? I had to make do with my leftover chocolate truffles. The weather was dark and drizzly. We saw a few snowflakes early in the day but then it just turned to rain. Little Sister who lives just north of us went home to several inches of snow. I was so jealous. The family tradition of singing the Twelve Days of Christmas was a disaster. No one could remember it. Someone needs to print out a copy. After lots of rough housing, the two great-grandboys were worn out. So were the rest of us as we all headed home for Christmas Part 2. I have very fond memories of sending my dear little first grade students off for their winter holiday after showing them this lovely film version of Raymond Briggs' The Snowman. After the events in Connecticut, those memories are especially poignant. This scene always puts a lump in my throat mainly due to the ethereal "Walking in the Air" sung by St Paul's choirboy, Peter Autry. If you have never seen the entire film with the crazy 80's intro by David Bowie, you are in luck because some wonderful person has posted it on You Tube here. Warning: You will need a hankie. We all know what happens to snowmen in the end. There's nothing like waiting to the last minute to make several boxes of goodies for gifting. I've been on my feet in the kitchen since around noon and at this very moment it is almost 11 pm and I am still not finished. I would never have made it this far if I didn't have help. Since Daughter is out of town, she doesn't know it yet but I borrowed her fancy shmancy mixer. I love it. I WILL have one of my own by next Christmas. ...and finally a pan of spritz. Whew. Everything is wrapped and ready to go. I am hitting the hay as soon as the lasagna for Christmas Eve dinner comes out of the oven. Goodness. I am worn out. It is easier to bring Christmas to Daddio than it is to bring Daddio to Christmas these days. The only problem is that his house is a dismal man cave that defies tidying. We spent the day scrubbing and dusting in preparation for the big family dinner on Christmas Eve. I even talked him into letting me put up one of my trees. It is the first time he has let us put up a tree in the house since Mom died. It was quite a breakthrough. Mom always had the place looking like a million dollars so to disguise Daddio's neglect we went all out with paper chains and snowflakes on the beams. We even put some oddly shaped snowflakes in the windows. The luminaries that usually line my walk will be put on Daddio's porch. This year we put a heavy glass in them and some sand because it has been unusually breezy. While all this was taking place, we were also baking some fancy breads for gifting. Finally, we made a couple of quick presents for the Sisters. Awww.....they turned out very cute and were so easy to do. Now I just have to hope he keeps the place halfway decent until tomorrow.